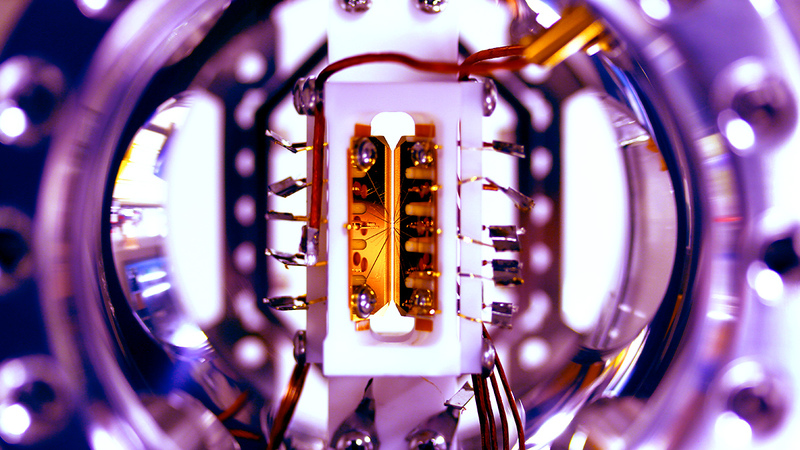 In a paper published as the cover story in Nature on August 4, 2016, PFC-funded researchers introduced the first fully programmable and reconfigurable quantum computer module. The new device, dubbed a module because of its potential to connect with copies of itself, takes advantage of the unique properties offered by trapped ions to run any algorithm on five quantum bits, or qubits—the fundamental unit of information in a quantum computer. To test the module, the team ran three different quantum algorithms, including a demonstration of a Quantum Fourier Transform (QFT), which finds how often a given mathematical function repeats. It is a key piece in Shor’s quantum factoring algorithm, which would break some of the most widely-used security standards on the internet if run on a big enough quantum computer. Two of the algorithms ran successfully more than 90% of the time, while the QFT topped out at a 70% success rate.